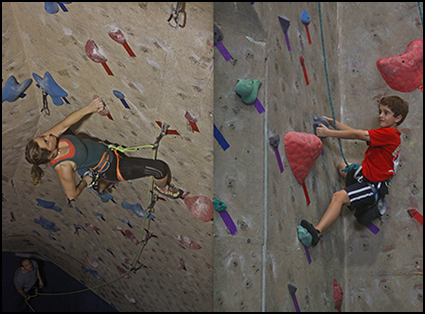 There is nothing that compares to the excitement and motivation that surrounds climbing competitions. They can be chaotic for the parents that watch their children on the edge of their seats and the staff members frantically running around making sure there is a judge at all times. 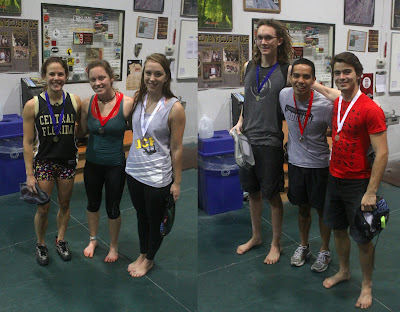 For the past three years, Aiguille Rock Climbing Center has taken on the task of hosting not only our annual Sport Climbing Series (SCS) Local Competition, but also the Collegiate Climbing Series (CCS) Regionals competitions. And on April 6th, 2013, yet again, the competitions were a great success. Tuesday morning Aiguille staff members harnessed up bright an early to start the monotonous duty of stripping the walls, taking down favorite routes and unfinished projects hold by hold. 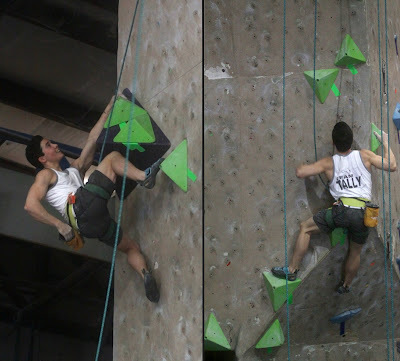 Not only did we have a competition to prepare for, but that night, members of the Rock Climbing Club at UCF would be hosting their Routesetting Competition as a fundraiser to send their members to CCS Nationals. 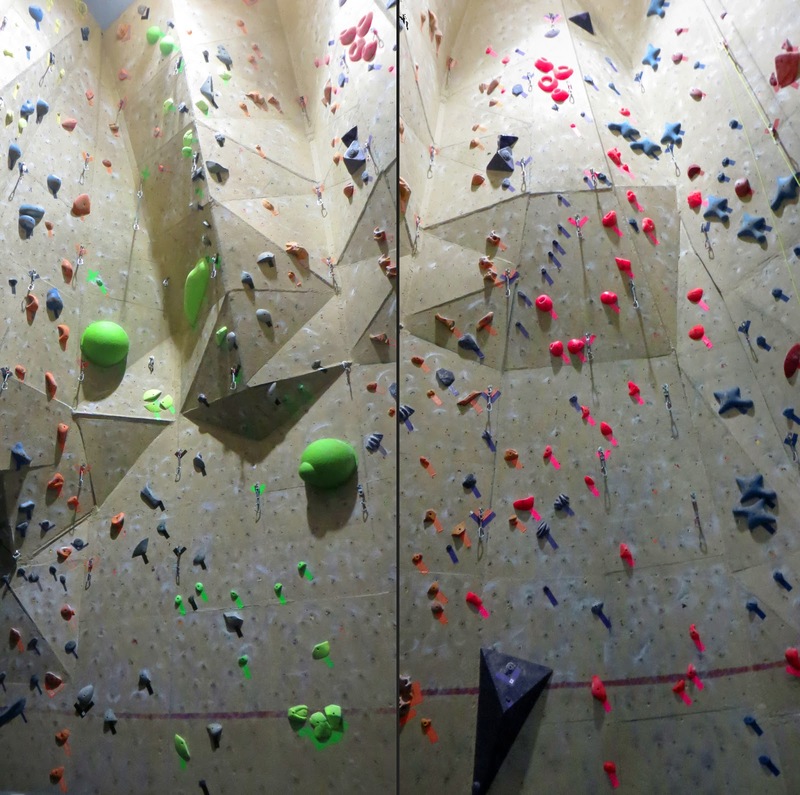 In a matter of hours, the walls stood out like blank canvases ready for the creative minds of Aiguille’s Routesetting staff to design inventive movements with colorful holds and geometric volumes of all shapes and sizes. 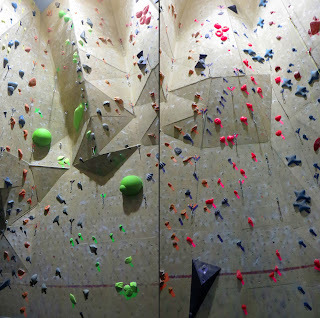 Customers would hover patiently around the gym, watching their future projects come to life as bolt by bolt, the routes that would determine the placing of some of the strongest climbers in the region made their way up the wall. This year, the competition setting crew was much larger than the past, which helped the stress and work load of Aiguille routesetters Mark Mercer, Aubrey Wingo, Doug Lutz, and Alex Velandia. Ivan Vargas from Gainesville Rock Gym and Aaron Davis from The Edge Rock Gym in Jacksonville would harness up along side as well as assistance from Aiguille’s very own Sean-Michael Smyth, Davis Stewart, Dean Pflaumer, Jackson Clemmer, Josh Jimenez, Tina Manner, Eugene Hoberg, Brian Lacey, and Greg Deemer. With different minds and thus different setting styles, the variety of routes and boulder problem made for an amazing selection for our competitors and for our customers afterwards. This year Head Routesetter Mark Mercer decided that the CCS Regional Competition should exhibit the talents of these strong climbers in the form of a finals round. Mercer and fellow routesetters Aubrey Wingo and Doug Lutz would create the perfect boulder problems and lead routes that would test these competitors and their physical prowess. In preparation in the days leading up to the competition, Mark designed his own fiberglass volumes using various types of balls to create unique shapes and designs (of which Aiguille staff battled over what to name them to no avail). These enormous orbs, painted lime green, the gym's famous Tempest hold, and along with a selection of matching Project climbing holds including their Shellshocked, Granite, and Edges sets, would be the star of the show on his lead men’s finals route, graded around 5.12c. His sequence challenged not only the flexibility of the climbers, but also their route reading skills more than anything, offering an intimidating mantle in our dihedral to a crowd facing dyno to the arete. Aubrey’s finals route for the ladies, consisting of an array of reddish-pink Climb-It Craters, Sediments, and Halos holds, was around 5.11b/c and focused on being consistently progressive with solid boulder-like movement to pump out the girls as they progressed through the route. The last move would put pressure on the already pumped climber with a solid five foot dyno to secure the win. As for the bouldering, Doug handled the women’s bouldering final problem with a classic powerful V4/5 sequence using red Rock Candy Dimples and E-Grips Myorca Jugs on Right Grey and Mark dazzled the Wave with the looming presence of a giant purple Teknik Hulk, E-Grips crimps and mini-jugs, and Rock Candy Baby Bumps. A couple of burly and dynamic throws to the lip would lead you to a show stopping mantle for the send. Once all these creations were forerun and determined perfect, the routes were taken down and hidden away as the finals round would be completed onsight format. Time was ticking away and the competition was becoming tense! Team Aiguille coach Brett Clemmer knows fully well on what that feels like. “The rush at the end of a comp is crazy. So many kids tried hard routes early, and needed to get a couple of routes in at the end to be sure to have all 5 that would count. I was running around with score sheets inserting them in clipboards while they were still untying from their previous route. But they got all 5 in!” Once Jim called time, the competitors would all run to turn in the scorecard and eventually one by one would pick up their ribbons with proud parents and coaches looking on. Team Aiguille coach Jess Jenkins finds that, “it is always rewarding, as a coach, to see youth climbers jump on routes that may be out of their comfort zone. If they fail to send, then you see their card right back in the pile for another attempt. It shows us that when faced with a challenge, they won't shy away, but come back at it with intent and focus in their eyes.” I think we can easily say that when the SCS comes to Aiguille, you’re going to have a good time. Scorecards were collected quickly from the college competitors in order to discover who would be in finals. Of course, many of us had expectations on who they would see in finals beforehand and this would influence our routesetters on how hard and what moves they would set. After scoring it up, the finalists were announced; the female finalists would be Preston Tam, Kirsten Martin, Michelle Schrader, Ashley Norton, Vicky Sinnott, and Jessica Jenkins. The male finalists would have seven instead of six and included Jorge Calabria, Chris Freiberg, Yuya Burkhart, Michael Brown, Joshua Larsen, Louie Talacay, and Wesley Fowler. Aiguille employees put up the isolation area in front of the yoga room where competitors could keep warm on the climbing walls while they waited to be called out one by one. In an instant, the gym was filled with the sound of drills and the ripping of duct tape as the routesetters reconstructed the masterpiece routes they created for the best competitors. Within a half hour, two lead routes and two boulder problems made their debut in front of the anxious audience. The finals round was in onsight format, meaning that competitors would be in isolation until their time came to see and climb the route. Competitors would have five minutes on the wall to finish their climb. Boulder problems could be attempted as many times as possible, but a flash (or completing the problem the first attempt) would grant them more points. The lead routes could only be attempted once and the highest hold they reached would determine how many points they would earn. The finals boulder routes would be pure onsight, however, due to the difficult sequences that Mark and Aubrey had laid out, competitors were given a five minute preview to look and discuss amongst themselves what beta they planned to use. Once time was up, competitors were escorted back to isolation and time began. One by one, competitors would come out to their problem; one would climb and another would have to wait, back turned the problem able to only use the audience’s faces and cheers as an indicator on how far their opponent got. The ladies struggled to find the correct sequence of their red boulder problem attempt after attempt until flashes were seen from Michelle and Jess, the only two ladies to send the problem. The men’s problem seemed to be intimidating at first, and many of the male competitors struggled to get through dynamic sequence on incut holds until Louie became the first to throw over the lip and hit the first Baby Bump. The crowd roared for him as he gained the high point above his previous competitors but the ground vibrated upon Wesley’s attempt, falling making the long mantle to reach up to the finish hold. Amongst the excitement of bouldering, the crowd would be running back and forth between the bouldering area and the lead room as competitors were simultaneously climbing bouldering and lead. For the girls, the ladies battled the consistently pumpy sequence of pink holds, making costly sequence errors confusing feet for hands and attempting to recover to power through the rest of the sequence. Thankfully, Doug would have their catch. For Ashley Norton, the hueco-like Halos would end her attempt just shy of the dynamic dyno finish. But for Vicky Sinnott and Jess Jenkins, it was a battle to the finish. However, the clever women wouldn’t attempt the dyno but creatively managed to stem against the adjacent left wall and with outstretched fingers begging to grab the finish hold. Vicky tickled the bottom of the finish with a great whip, but Jess would manage the send, just grabbing the finish hold with her tips and securing the match. This would entitle her with the win after flashing both her finals problems. For the men, the previews session already blew their mind as all they could say was “whoa”, admiring the sight of the large yoga ball volumes for the first time. If they were intimidated by the sight of the boulder problem, then surely grabbing these bulbous suckers on lead would be fun. Dean Pflaumer, who because of his extensive lead and competition experience, would have the honor of belaying for this route. “Aside from how obviously awesome I am (just kidding), its mind-numbing how much fun it is to belay on an amazing route with incredible climbers.” The crowd was ready boil over with anticipation; it was obvious that this route was going to spit people off but where; at which ball? At which move? Many mastered the first orb. Josh Larsen, screaming with all his might, pushed into the second orb, squeezing between it and Tempest. CCS competitor Michael Bird watched on and found it amazing “when Josh was about to move to the giant ball volume and then he had to back-track. It looked like he might fall, and then all of a sudden dynoed to it and stuck it." After their performance during the bouldering portion, everyone was excited to see what Louie and Wesley were going to do. Eventually both made the required clip to the extended draw, standing into the dihedral on Tempest and the Yoga Ball, staring at the next two holds; a double clutch dyno to the arete. Louie managed to touch the leftmost hold for the positive movement, but it was Wesley’s attempt that brought the goosebumps, connecting the the first jug with the wrong hand, sticking it, but with significant swinging motion, unable to hold on. Although both competitors were facing into the wall, Mark’s intended beta would have them face the crowd, something that either the competitors didn’t think of, or were too scared to try. Nonetheless, Wesley's performance easily put him ahead of the rest for the win. At the end of the day, exhausted and out of psych, competitors and employees said their goodbyes until the next competition. For SCS kids, Regionals would be the only competition on their minds, and the CCS students would have National to look forward to on April 19-20th. It was a great showing from all sides and we can always say that we can’t wait for the next one. A big thank you to USA Climbing for allowing us to put on these amazing events. Thank you all the parents of the children who drove from around the corner and from out of state, and all the the competitors from around the region that could join us. Thanks to our sponsors, Evolv, Trango, La Sportiva, Organic Climbing, Joshua Tree, Mountain Khaki and more. Thanks to Jim Norton and Jorge Calabria as our Regional representatives. Thank you to all the routesetters of Aiguille and our friends that traveled from out of town to help up with this event. And a HUGE thank you to all our volunteer belayers that allowed us to make this competition happen. It takes a lot of people to make these competition happen, and if you were even a spectator who did nothing else, thank you for sharing these memories. All pictures to be coming soon!